"Here reposes the dust" — maybe it's time to start a 101 Ways to Say "Here Lies" series. Hepzi — was she Hepzibah called Hepzi, or was Hepzi her given name? This epitaph is another example of the use of a gender-neutral pronoun to refer to an small child. 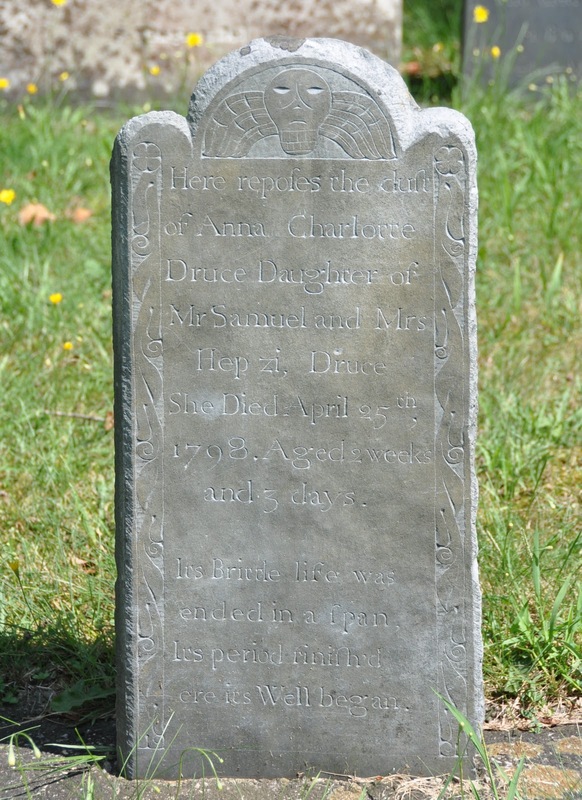 Samuel and Hepzi Druce were in the habit of giving their children middle names, a relatively new fashion in New England in the late 18th century. Some New Englanders had been given family surnames as middle names in earlier years, but names like "Anna Charlotte" would have sounded very modern. > "Here reposes the dust" — maybe it's time to start a 101 Ways to Say "Here Lies" series. I saw one in Leominster today that said "terminated his existence" -- has a bit of a sci-fi ring to it.